The equipment consists of and Explosion proof aluminium (flameproof box) with intensive LED indicators, intrinsically safe sensing line with 10 m cable and clamps, and holder. Optionally we can provide sensing cable with extended lengths of up to 20 m, coiled cable, or a cable reel. EGT series grounding monitors are designed for safe unloading and loading of liquids or gases in explosive areas. The equipment measures whether a vehicle is grounded properly to avoid risk of ignition . Correct grounding is considered as an interlock condition for loading/unloading. High level of IP protection, extremely wide temperature working range and EC (ATEX) certification allows installation of the equipment worldwide. 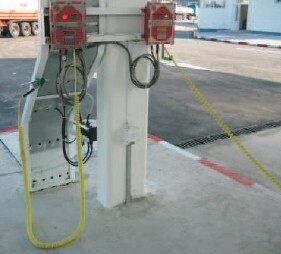 The equipment can be installed in loading terminals for monitoring of grounding states of tank trucks, railcars or on vehicles. Settings for specific applications are made in factory but the units are flexible and can be configured differently if there is a change. Necessary tools for re-configuration are available on request. 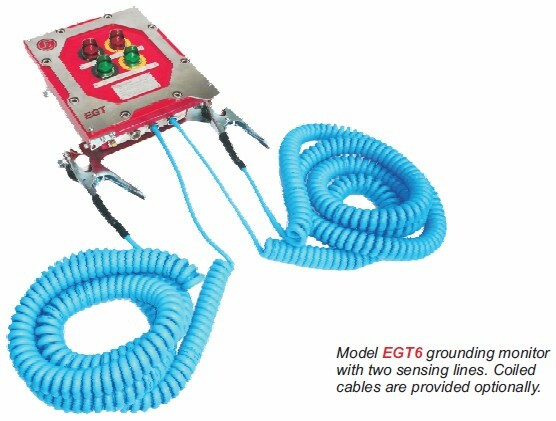 The grounding monitor Model EGT4 is equipped with one sensing line while EGT6 has two lines. The EGT6 electronics allows independent settings of both sub-systems e.g having one to serve tank trucks and also other railcars. The main function of the ground test equipment is the verification of the grounding status. 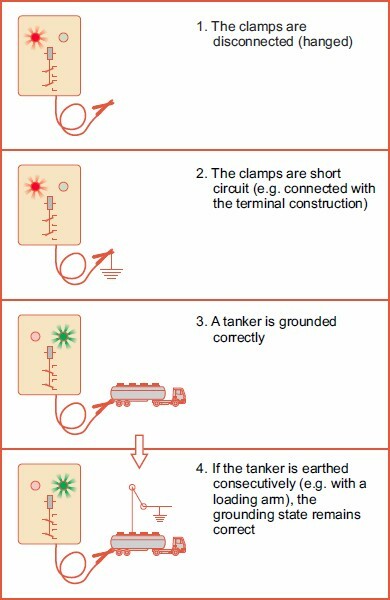 The EGT is intelligent enough to no only recognise the three different states (1-Clamps are not connected (hanged), 2-Vehicle is grounded correctly, 3-Clamps are short-circuit to earth) but also their sequence which allows correct evaluation of proper grounding in different operating conditions. EGT indicates the grounding state by lights on front panel and by relay contacts. The contacts supposed to be connected with the electrical, automation, or ESD system which shall block the loading if grounding state is not correct. The equipment uses a combined measuring principle to verify the grounding state and is very resistant against the incorrect usage as shown on the second diagram. If the clamps short-circuit to the ground, then EGT recognises this as wrong grounding. This pushes the operators to pay necessary attention to correct grounding of each tanker, and increases operating safety (this feature is available only by trucks - not railway cars).